Last year when we moved to Iowa, my parents came to visit just before the cold set in. Dad was sure that I might freeze to death over my first Iowa winter, so he proceeded to take me to Cabela's, where he could look for the 4.0 Under Armour (fancy long underwear for the most brutal of temperatures and conditions) he had already researched. I'll never forget the sweet bubbly brown-haired girl who helped us find what we needed in the massive outdoor sporting goods store. I asked her if she thought I'd actually need the 4.0-rated long johns, and with a completely straight face, she replied, "Only if you're ice-fishing." I may have smirked or even laughed out loud a little; didn't people only go ice-fishing in Alaska and Canada? Anyway, she continued to help me pick out some 2.0 Under Armour (slightly less serious long johns), some things for Zach, and a few nice pairs of gloves—ones she personally used and liked. With our new Iowa winter necessities, my folks were able to fly back to NC slightly less concerned about us freezing to death. 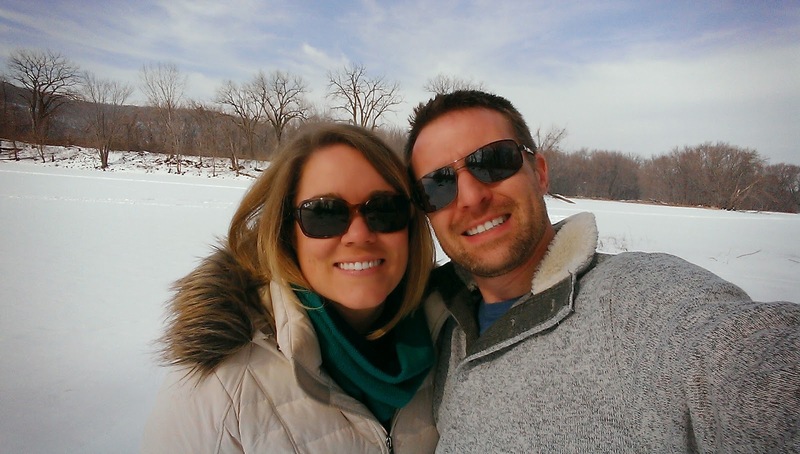 A few weeks later, the temps plummeted and I experienced the first true "freezing" temperatures of my life. I remember the first time I stepped outside and breathed in the -10 degree air. It was like nothing I'd felt before. Anything close to or below 32 is absolutely frigid where I was raised. 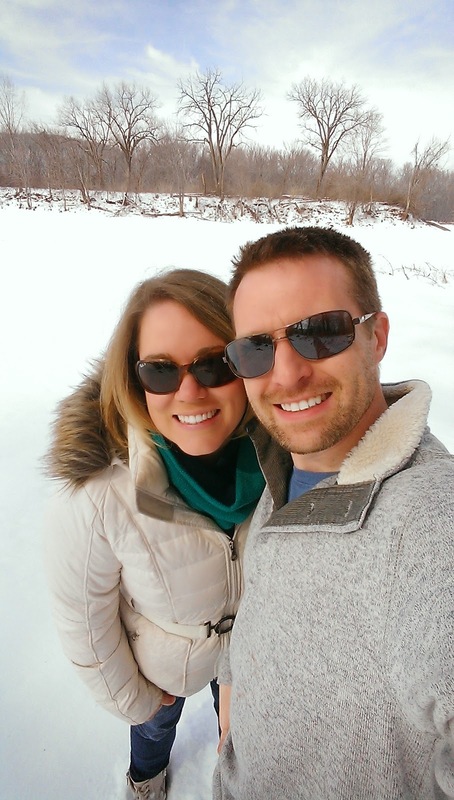 The snow and the negative temperatures were exciting and we acclimated really fast! A few weeks passed and Zach's folks flew out to spend our first Thanksgiving all together on the farm. We drove over the frozen Mississippi River, and Zach's dad pointed out the ice fishermen. I couldn't believe it. The funny sweet girl at Cabela's wasn't "being funny" when she helped me pick out my Under Armour—people in Iowa actually do go ice-fishing! 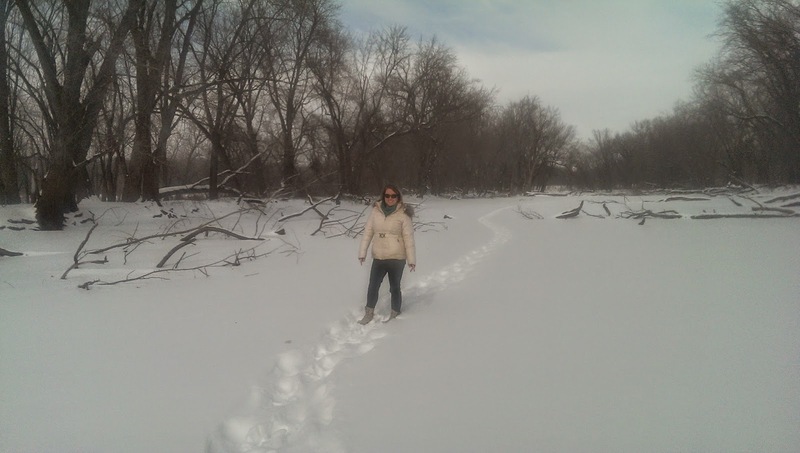 As a child we were always warned not to ever walk on a frozen pond, or play in the snow-covered creek, etc. It was a huge fear that one of us would slip through the ice trying to imitate the snowy frozen scenes we'd seen on TV and in movies. Having seen the ice fishermen for the first time in my life, I had the immediate desire to join these people out on the ice... but I didn't. Fast forward a year. After running a few errands on a Saturday morning joy ride, Zach and I headed back over the bridge where I had first seen the men sitting on buckets, sprinkled out over the frozen river, waiting for the fish to bite. There they were, a year later. We pulled into the recreational lot and parked between the row of pick-ups. Excited, we jumped out of the car and made our way down the steps to the Mississippi frozen back waters. Eeeeee!! I felt a rush of adrenaline as I stepped out on the trail of foot prints before us. We walked, even ran along the path and then blazed our own trail over toward the ice fishermen. I wasn't really sure our first steps were on the frozen river or ground because of the thick fluffy snow blanketing the whole area. As we made our way left, over a small hill, there they sat. A randomly sprinkled row of fishermen, propped on their 5 gallon buckets, lines in the water, and a even a few tents erected right there on the ice! Not knowing whether we had even actually been walking on ice, I had to walk down the short hill and out onto the level plain where I knew (don't worry Mom, there were several grown men out on the ice and even snowmobiles) a thick block of ice held up all of these men as they fished. I did it! Was I nervous? You betcha! 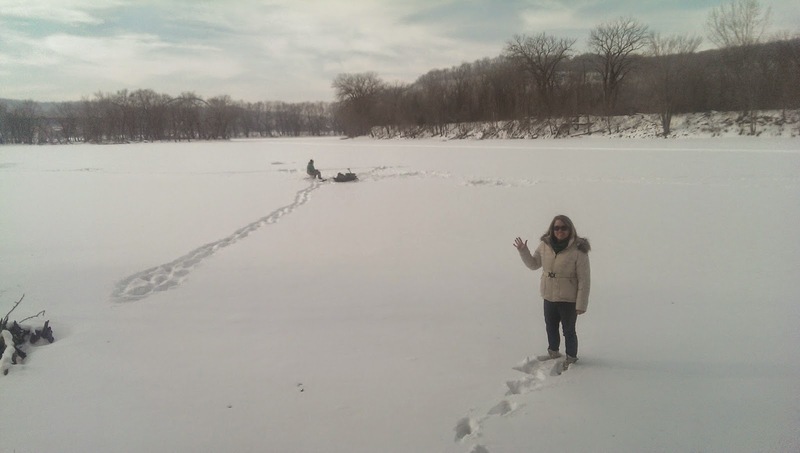 Okay, so we were not quite "ice-fishing," but it was awesome! And yes, there was a mini snowball fight on the trek back to the car... gotta keep him on his toes! just in time for ♥♥♥ Valentine's Day! 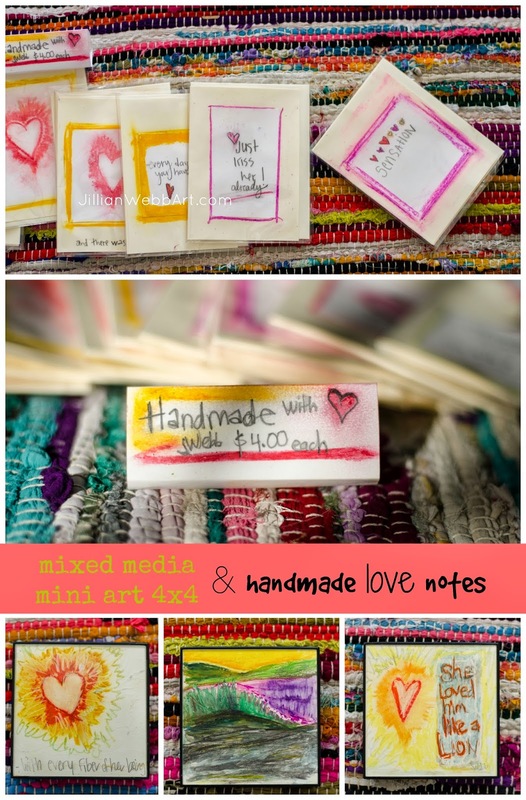 This week I decided to make a very limited number of handmade, flirty, fun love notes. These whimsical notecards inspired a new series of mini mixed media artworks—what a win-win! Are you still looking for a romantic token to surprise your honey with on Valentine's Day? These mini works are 4x4 inches, one-of-a-kind, and ready to gift with simple black frame for only $18 each. Pop into Willow Creek this weekend to see in person. The Elkader Cultural and Entertainment District is currently planning for Elkader's first annual fine art festival! Please join us for: Art in the Park-- held August 22 and 23, 2015, in beautiful Founders Park of Elkader, Iowa. Art in the Park will feature over 30 professional NE Iowa artists, culinary masterpieces, live music and performance art, kids' tent, contests, and more! Interested in supporting Art in the Park 2015? Labels: Art, Art in the Park- Elkader, Iowa Art, Summer 2015!